Vaccine attorney Leah Durant also represents those who have suffered shoulder injuries as a result of receiving a flu shot, or any other vaccine. Individuals can be injured by the method that the flu vaccine is administered, not just by the contents of the vaccine. Flu shots are generally administered using needles and if administered improperly, can cause damage to the shoulder. Compensation is available from the Vaccine Injury Fund if your flu shot has caused a shoulder injury. If your doctor has diagnosed you with shoulder pain, adhesive capsulitis, torn rotator cuff, bursitis or tendonitis after receiving a flu shot, or any other vaccination, you should contact the Law Offices of Leah V. Durant, PLLC, immediately. If you have suffered from a negative flu shot reaction, Guillain-Barre Syndrome , shoulder pain, or any other illness subsequent to receiving a flu shot, please contact us today. Vaccine attorney Leah Durant is available to provide you with a free telephone consultation. This vaccine attorney is a seasoned litigator whose practice is dedicated to serving those injured by vaccines. Flu vaccines are comprised of different strains each year. There are many flu viruses, many more than a single vaccine could protect against. Each year, scientists from the Center For Disease Control and the Food and Drug Administration attempt to determine what vaccine strains will be prevalent during the following flu season. Flu vaccines are then manufactured based on those educated guesses. Consequently, the influenza vaccine ingredients can vary from year to year. Some years, the flu vaccine is more effective than others in preventing individuals from suffering with the flu vaccine. Seasonal flu season can run from as early as October to as late as May. Not everyone should receive a flu shot. Those who have allergies to eggs should consult with their physician before receiving a flu vaccine. In addition, people who have previously suffered from a severe allergic reaction after receiving the flu shot should generally avoid vaccination. It is also recommended that those who are suffering from a moderate to severe illness, with or without fever, should wait until they have recovered before receiving their flu vaccination. People who have had Guillain-Barre Syndrome should not receive a flu shot without consulting with their physician. 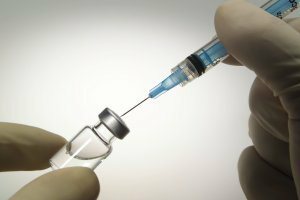 If you have received a flu shot and developed Guillain-Barre Syndrome (GBS) or the more chronic form Chronic Inflammatory Demyelinating Polyneuropathy (CIDP) in the days or weeks later should contact the Law Offices of Leah V. Durant PLLC today. Vaccine cases involving flu vaccine and GBS/CIDP are common and are often successful. Compensation can be awarded for past and future medical care, pain and suffering lost wages. In addition, any Medicaid liens can be discharged. The Vaccine Injury Compensation Program pays for your attorney, not the client who has suffered from GBS or CIDP so call the Law office of Leah V. Durant, PLLC today. You cannot get the flu from receiving a flu shot. However, there are some medically accepted side effects. These include serious disease processes such as Guillain-Barre Syndrome, or GBS. Other recognized side effects include permanent shoulder injuries related to the administration of the vaccine, also known as SIRVA. Less serious symptoms such as runny nose, wheezing, headaches, vomiting, muscle aches, cough, sore throat, and fever have all been reported after flu vaccines. Allergic reactions, particularly for those who have severe egg allergies, have also been associated with flu vaccines. As with any vaccine, receiving a flu shot can result in soreness, swelling and redness at the injection site. Leah Durant has been admitted to practice at Court of Federal Claims since 2008. Her office is located literally steps away from the Vaccine Court. Her practice specializes in vaccine claims and she represents clients from all over the country. Because the Court of Federal Claims has national jurisdiction over all vaccine matters, Vaccine Attorney Leah Durant can represent you at the Court no matter in which of the 50 states or U.S. territories you reside. Few law firms understands vaccine litigation at the Vaccine Court better than the Law Offices of Leah V. Durant, PLLC. Vaccine lawsuits are claims against a government-administered fund and this fund also pays for the services of vaccine attorneys like Leah Durant. In other words, vaccine attorneys provide their services at no cost to the vaccine-injured person. The Court decides the amount of fees and costs to which your vaccine attorney is entitled and this amount is separate and apart from the amount awarded to claimants for their vaccine injuries. There is no contingency arrangement permitted and the vaccine attorney’s fees are entirely determined by a judge or special master of the Court of Federal Claims and paid from the government-administered trust fund. If you or a loved one has experienced an adverse reaction to the flu vaccine, including but not limited to Guillain-Barre Syndrome, Chronic Inflammatory Demyelinating Polyneuropathy, or shoulder injury related to vaccine administration (also known as SIRVA), you are encouraged to call the Law Offices of Leah V. Durant, PLLC, immediately to discuss your case. Compensation may be available for your vaccine injury and no one will handle you case more efficiently and professionally than the vaccine attorney at the Law Offices of Leah V. Durant, PLLC. Contact us at 202-775-9200 or by emailing info@vaccinelaw.com.